Excellent Scrubs to Bring Out the Woman in You and Make a Statement While on Duty! As a woman, you love fashion. So, even if you are on duty, you'd still want to wear your style and color. Here's good news. With this best seller scrub set, you can accentuate your assets and features naturally and make them complement your style! Wash and Clean with Ease! Professionals working in healthcare facilities are usually exposed to harsh chemicals, thus the need for using special cleaning agents to clean their scrubs. Obviously, that type of cleaning can potentially ruin the clothes. But in the case of this top rated Scrubs set, it can withstand Machine Wash with high temperature cleaning without shrinking or color fading. Scrubs like this provide plenty of space for medical professionals to carry their equipment and tools, such as bandages, swabs, gloves, IV caps, pen lights, and notepads. That is why we designed this scrub set with all sizes pockets, so all their medical gears can be packed and carried when the need arises. Designed to Accommodate Most Medical Facilities! 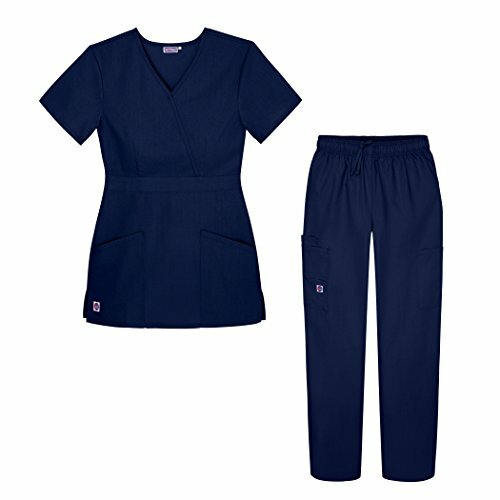 Depending on the rules of the medical facility you are working for, We designed this scrub set with a solid colored print that is accepted or required in most offices and hospitals. PANTS: Natural-rise, tapered legs, Inseam 30"
If you have any questions about this product by Sivvan, contact us by completing and submitting the form below. If you are looking for a specif part number, please include it with your message.